Many of the women nominated to this year's Tribute to Exceptional Women attended the announcement. The achievements, leadership, and service of women in the Tri-County Area are in the spotlight as the YWCA Tri County Area presents its 24th annual Tribute to Exceptional Women at 5:30 p.m. Thursday, March 28, at the RiverCrest Golf Club and Preserve in Phoenixville. Community members have nominated 28 women for their achievements in leadership, service, and career in the following categories: Arts, Business, Education, Health, Racial Justice, Non-Profit, STEM (science, technology, engineering, and math), the Rising Star Award for women 18-30, the Coretta Scott King Award for an agent of change, and Sally Lee Lifetime Achievement Award. The 24th annual Tribute to Exceptional Women recognizes women for their ability to lead by example, embrace community responsibility, and excel in their careers. dean Beth McManus Burkhimer and Kim Petro. 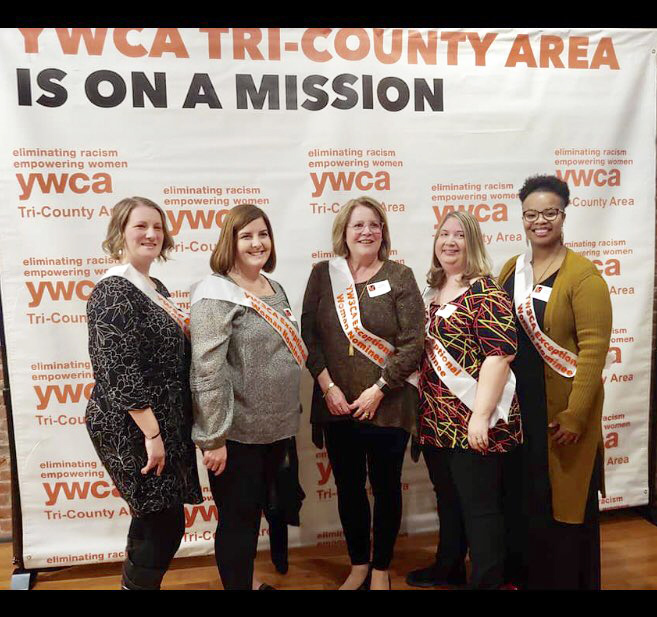 YWCA Tri-County Area has been proud to provide this opportunity for the community to recognize and celebrate the exceptional contributions made by women in the Tri-County and surrounding areas. The evening will begin with cocktails and bidding on silent auction items from 5:30 to 6:30 p.m., with dinner, the keynote speaker, and presentation of awards to follow. Proceeds from Tribute to Exceptional Women support YWCA Tri-County Area’s mission to eliminate racism, empower women, and promote peace, justice, freedom, and dignity for all. YWCA Tri-County Area educates children, youth, families, and communities through programming that empowers individuals to learn and grow throughout the lifespan, providing the foundation for a healthy and thriving community; and advocates for racial and social justice, empowerment and economic advancement and women and girls, and health and safety of women and girls. Alneasa Jordan of West Reading, who provides prom dresses for girls through Girls Empowerment Movement. She created and manages the CARE Closet program at the DoubleTree Hotel in Reading, providing employees with a closet of gently used items. Anne Maletsky of Pottstown, a senior financial analyst at Exelon’s Limerick Generating Station. She mentors women entering the nuclear energy industry, is a champion for women’s rights in the workplace, and is an active community volunteer. Beth Burkhimer of Pottstown, Dean of Students at Pottstown Middle School, an advocate for the students and teachers and administrators alike. Brooke Fisher of Pottstown, a detective and one of two female officers on the Pottstown police force. Carol Daniels of Gilbertsville, an active community volunteer who has served on many non-profit boards over the years, including YWCA Tri-County Area. She is a manager at BB&T Bank in Oley. Cathy Sikorski of Pottstown, a retired attorney who has written two books: “Showering with Nana” and “Who Moved My Teeth”. She is an expert in elder law and shares her knowledge with community groups to senior citizens and caretakers. Chandra Weghorst Masimore of Pottstown, a manager of technicians at Merck who ensures product quality. She is a leader at her workplace and an active community volunteer. Cheryl Messere of Manor Township, an advocate for people who are homeless and for women and girls. She co-founded the People to People Mission Project at the First Presbyterian Church in Phoenixville. Christine Stenner of Harleysville, who co-founded Indivisible HOPE to promote political activism through education. She is employed in the office of Pa. Rep. Steve Malagari (D-53), working to ensure the health and wellness of the district’s constituents. Denise Schleicher of Pottstown, a fourth-grade teacher at Lincoln Elementary School in Pottstown. She packed numerous lessons for children into a book, “The Ugly Christmas Tree”. Elizabeth Peters of Reading, the business deveopment officer for the Tri-County Area Federal Credit Union, provides budget workshops for children and adults as part of the credit union’s community outreach. She serves on the board of the Pottstown Cluster of Religious Communities. Heather Long, a detective in the Pottstown Police Department, works to protect and support juveniles, sexual assault victims, and vulnerable women and families in Pottstown. She participates in the Pottstown HUB community response. Jamie Fazekas, a third grade teacher at Rupert Elementary School in Pottstown, works to educate, empower, and inspire her students. She also is supportive of her fellow teachers, especially in mentoring first- and second-year teachers. Jane Stahl of Boyertown, a former Boyertown High School Teacher who now works with Studio B Arts and Activities Alliance in Boyertown. She oversees general operations and grant writing for the organization. Jessica Schneider of Gilbertsville, a nonprofit and mental health advocate for more than 20 years. She is a community champion who has dedicated more than 20 years to serving nonprofit organizations as a staff and board member and consultant. Keima N. Sheriff, an employee of Montgomery County Community College in Blue Bell, where she works with peer mentors and the Minority Student Mentoring Initiative. She also leads MCCC’s Gateway to College program for high school students. Kelly Kratz of Pottstown, national lead trainer for the Positive Coaching Alliance and developer of the training program used throughout the organization. She works with teens in Young Life, a Christian-based leadership program. Kimberly Camp of Collingswood, N.J., a professional artist whose artwork advocates for social justice, equality, and human rights for all people. She has led workshops and residencies at a number of arts organizations, including the Smithsonian Institution and the African-American Museum in Philadelphia. Kim Petro, a language arts teacher at Pottstown Middle School who also works with students in 21st Century Learning Center after-school projects. She is a strong role model for all students, but especially for girls through the Girls Today, Leaders Tomorrow program. Laurie Kolka, director of curriculum and instruction/professional development for the Pottstown School District, provides transformational leadership for students, staff, and families. She works closely with the Pottstown Trauma Informed Community Connection and the Family Advisory Committee. Lizette Epps of Reading, who founded Breath of Hope LLC, providing career navigation services and motivational speaking. She shares her inspiration with community organizations, helping underserved people establish a plan for future success. Micheele Mory of East Greenville, an employee of CURVES who motivates all to live a healthy lifestyle. Na’imah Rhodes of Pottstown, an early childhood education teacher in the Pottstown School District, who takes pride in teaching “outside the box”. She volunteers throughout the community, including with after-school programs for children. Patrice Reiche, a teacher at Owen J. Roberts School District who leads the gifted program for elementary and middle school students. She is a role model for all students, but especially for girls as she demonstrates how talents can transfer across professional and community interests. Sherita Beard-Lee of Colmar, founder of Suite Dreams to provide children and adolescents from low-income families with bedroom furniture and bedding. She works help youth get a restful night’s sleep so they can be ready to learn at school the next morning. Suite Dreams also provides dorm essentials for college students with financial need. Stephanie Brown of Reading, who has dedicated her career to adults with intellectual disabilities. She works at KenCrest Lifesharing, promoting support to families who welcome adults with intellectual disabilities into their homes. Terri Koehler of Pottstown, principal at Lower Pottsgrove Elementary School, who has served as a teacher and administrator in several school districts, including 11 in Pottsgrove. She works to create an environment that strengthens children, bringing trauma-informed care and practices to the school district. Tracy Heebner of Pottstown, owner of Salon Twenty-Two and Spa, a successful business owner and community volunteer. She mentors and trains young women , and is an active volunteer with Olivet Boys and Girls Club of Pottstown. 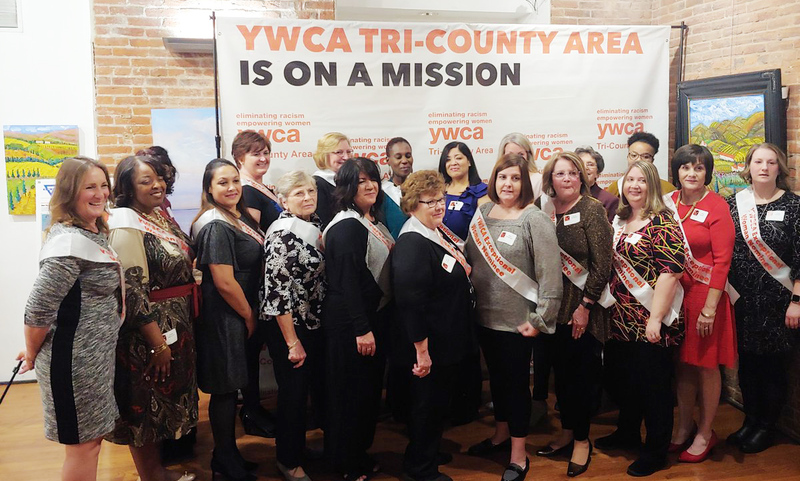 YWCA Tri-County Area is dedicated to eliminating racism, empowering women and promoting peace, justice, freedom and dignity for all. YWCA Tri-County Area is a leader in advocacy for women and girls, works to eliminate racism, and empowers women through quality affordable childcare, adult literacy, and a host of programs to support the health and vitality of women, girls, and families.